1. Young hedgehogs are referred to as pups or hoglets. Adult male hedgehogs are called boars and adult females are called sows. 2. The average lifespan of a hedgehog is between 3.5 years and 9 years. 3. The gestation period for a hedgehog is 35 days. The litter size ranges between 4 and 9, but 9 is on the high end. 4. A baby hedgehog is born with the spine just underneath its skin. Within just a couple days, it will “sprout” through the skin. 5. Owls and ferrets are a couple of the few creatures that prey on the hedgehog. Adult male hedgehogs sometimes prey on the baby hedgehogs unless the mother is vigorously guarding the nest. 6. 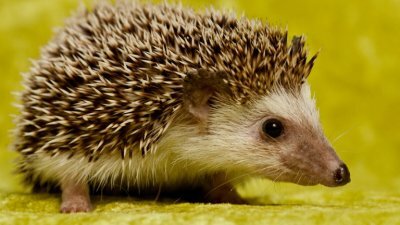 In some states, it is legal to have a hedgehog as a pet. But due to the specific diet that they require and the type of shelter they need, they are very high maintenance and difficult to care for. 7. One of the most distinctive characteristics of hedgehogs is their quills. A hedgehog has an average of 5,000 to 7,000 quills, which are basically just modified hairs that are not very sharp. 8. A female hedgehog can become fertile as early as 6 to 7 months year old. Their fertility lasts until they are about 3 years old. 9. Wobbly Hedgehog Syndrome (WHS) is a genetic disorder that afflicts many hedgehogs. It results in progressive paralysis, eventually causing complete paralysis. In addition, they can also be victims of cancer. 10. Many hedgehogs lose their eyes due to being poked by quills. This happens when many hedgehogs are housed together in a small space. 11. Hedgehogs have a diet of moths, grasshoppers, beetles, ants, centipedes and earthworms when they are living in the wild. When in captivity, their diet generally consists of cat food, ferret food, cooked poultry and cooked eggs. They are, however, lactose intolerant. They should only consume between 70 and 100 calories per day. 12. Much like a porcupine, a hedgehog will roll itself into a tight ball when it is attacked or threatened. This is to ensure that the quills are pointed in every direction. This is also how they sleep so they can stay safe while they are resting. 13. Hedgehogs are able to climb trees and swim. 14. In the wintertime, hedgehogs hibernate. 15. A group of hedgehogs is called an array. 16. Hedgehogs have an immunity to several toxins which allows them to be able to eat small poisonous snakes without suffering any ill consequences. 17. A male hedgehog is attracted to females in heat because of the scent that the females emit during this time. A male hedgehog will circle the female for hours until she allows him to mate with her. 18. Although hedgehogs have relatively poor eyesight, they have a strong sense of smell and very sharp hearing. 19. If two hedgehogs are placed in very close quarters, they will probably end up fighting as they are very territorial. 20. The quills on a hedgehog fall out about once a year at which time it is replaced by a new quill. 21. Hedgehogs have been given the name “gardener’s friend” because they often eat the pests and insects that can ruin gardens. 22. Baby hedgehogs will stay with their mother for the first 6 to 8 weeks of their life. After that, they will head out on their own. 23. There are believed to be 15 species of hedgehogs living in the world. 24. Hedgehogs are nocturnal. They come out at night to hunt for food, but they sleep during the day underneath bushes and shrubs. 25. Hedgehogs can have 500 fleas on their body at any given time. However, this type of flea does not bite humans.